Bats are the only mammals with wings, the only mammals that can truly fly, and the only mammals that rest and sleep while hanging by their hind feet! There are over 1000 species of bats in the order Chiroptera, and they exist in almost every corner of the world except the polar regions, and areas of extreme desert. Bats are separated into two suborders called megabats and microbats. As the names imply, the megabats are the largest bat species, and the microbats are the smallest. Microbats are carnivores or insectivores who have small eyes and generally use echo-location to hunt. 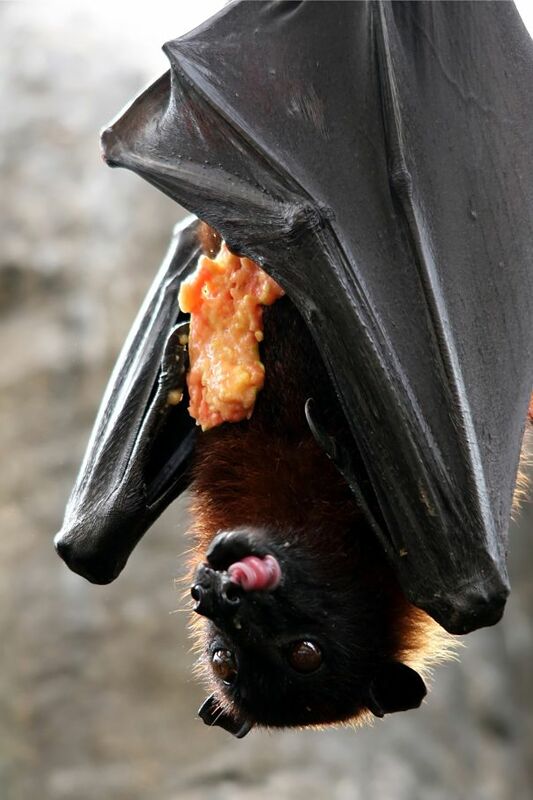 Megabats, like the enormous flying fox, which has an average wingspan of over 4 feet, are fruit or nectar eating animals. Megabats have large eyes and fairly good vision. Although it was once thought that they do not echo-locate, there are some species of fruit bats that have been discovered to use wing noises, not vocal clicks, to help find their way in the dark. 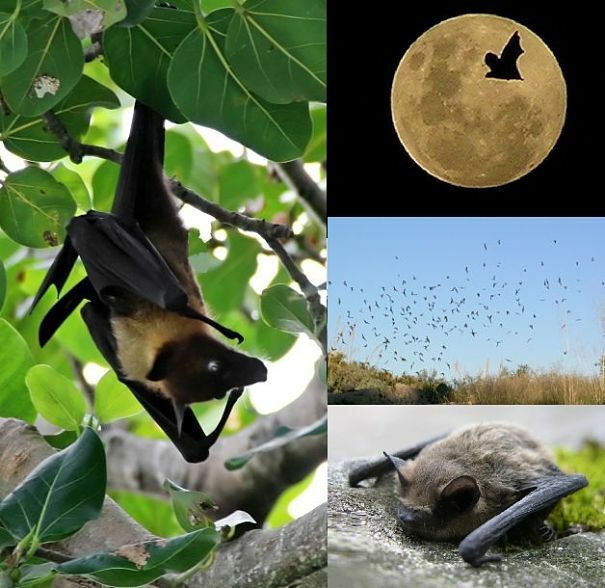 The insect-eating microbats may consume hundreds or even thousands of insects in an evening. They spend their days hanging upside down by their hind toes beneath a bridge, in the roof of a barn, or in a cave, and then swoop out, often in colonies of hundreds, come dusk, to flit around in the sky snatching mosquitoes as they go. The bat is an animal that causes many folks to squirm in fear or disgust, but without them, the world would be over run with mosquitoes, gnats and flies, and diseases like malaria and West Nile virus would be far more prevalent. It is conceivable that without the many millions of insect eating bats in the world, the human population might even be in peril. Not all microbats eat insects, however. Several species eat small rodents and reptiles. A few even eat fish, snatching them out of the water with their hind claws just like bald eagles do. 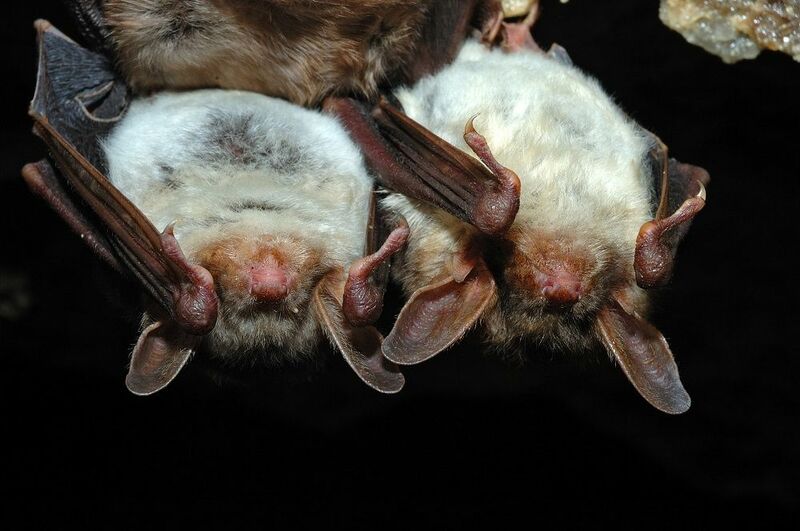 Three species of bats from Mexico and South America eat the blood of living (usually sleeping) animals. These vampire bats are tiny creatures that make 1/4 inch punctures in the skin and lap up the blood with their tongues - gruesome! Their victims are generally sheep and cattle, and usually don't feel a thing as the vampire bat strikes at night and leaves without a sound. The small, insect eating microbat species are not restricted to tropical jungles or lost caverns, but are quite comfortably adapted to urban living. Although they live largely undetected, bats are very common and very populous throughout the worlds major cities, roosting in the eaves of skyscrapers and famous landmarks like the Eiffel tower and the Statue of Liberty, waiting for sundown to swoop out and hunt under the stars in Central Park or Piccadilly Circus. The expression "blind as a bat" is actually a very old simile that is not at all accurate. Its origin is understandable though, when you know how bats fly in the dark. Insect eating bats use echolocation, or biological sonar, to track down insects as they fly. These bats send out incredibly rapid squeaks, clicks, and chirps - (over 100 per second!) - that are such a high frequency human beings can't hear them. The chirps bounce off surrounding objects and are interpreted instantaneously by the bat. The bats extra large ears and excellent hearing are designed for this task. 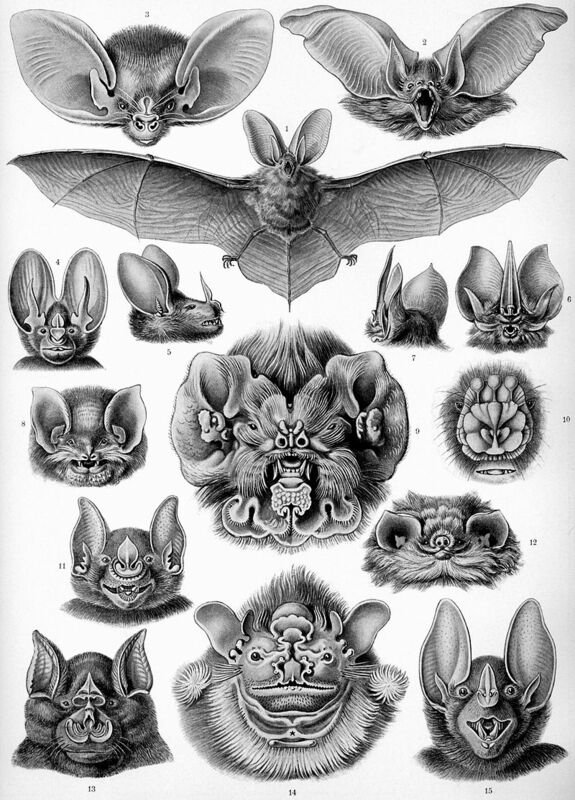 They make these sounds with their larynx, tand sometimes their nose, which is why some bats have such odd, often scary looking faces, with folds of skin called "nose leaves", which funnel chirps out in the right direction. Based on the echos it receives, a bat can "see" it's environment in total darkness, and track the fight of dozens of insects at a time as it flies. It plots a course and zigs and zags up, down and back to catch insects in mid air. All of this activity may give the appearance of a very awkward and erratic animal that "can't fly straight" and "can't see where it's going", while in reality the bat knows exactly what its next move should be and adjust its flight in a fraction of a second. Bats have been known to fly into trees and even crash into each other when there are too many in one place, however. Their signals get crossed and they must disperse quickly in order to avoid each other. This is why large colonies fly out of their roosts at such great speeds at dusk, they are trying to fly clear of each other as quickly as possible. In addition to being able to echo-locate in the dark, bats can and do actually use their eyes to see in the daylight, and probably have similar vision to humans. They are nocturnal animals though, and their eyes are fairly sensitive to light. They may shield their eyes with their wings - just like Dracula - when a flashlight hits them, and that my add to the idea that there is something amiss with their eyesight. So, long story short, not only can bats see just as good as humans in the daylight, they "see" better than an owl at night - by using their mouth and their ears! The megabats and the microbats are actually very different creatures that some theories say have been evolving separately for millions of years. Popular belief is that the two sub-orders last common ancestor was about 70 million years ago during the Eocine era. This animal was most likely a tiny, tree dwelling creature similar to a sugar glider, that had developed skin flaps to help it leap from limb to limb, but did not yet have wings. At a time when many new plant and animal species were emerging, the megabats ancestors began feeding on fruits and flowers, particularly of those plants that bloom at night. This proved to be a successful tactic and the megabats developed large eyes for better night vision, specialized teeth for the diet, and in some species a form of echolocation using sounds created with their wings. 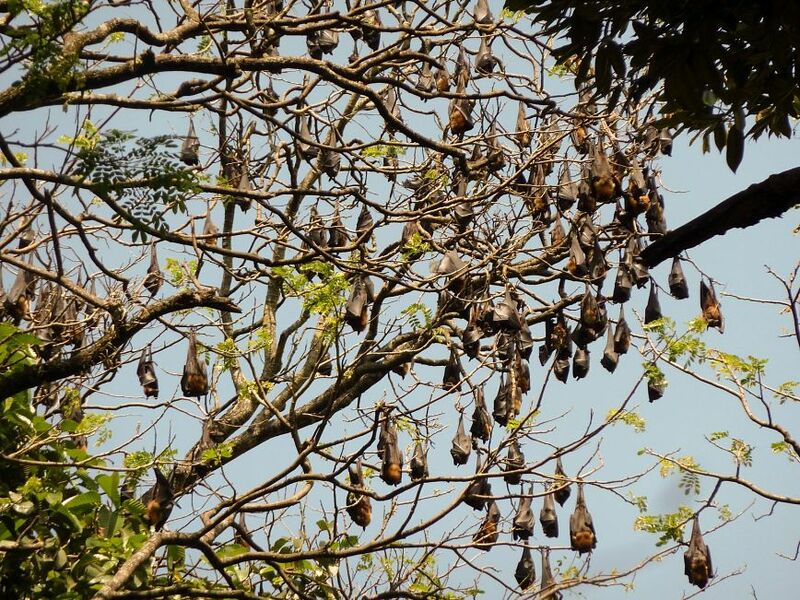 They became about 200 species of fruit bats and flying foxes, and today the ecological niche they fill is vitally important to their environment. Megabats live in mostly tropical environments that are being threatened by deforestation, and they not only disperse seeds for hundreds of plant species, they also pollinate many plant species just as bees do, by flying from flower to flower. There are some plant seeds that must pass through a bats digestive system in order to sprout. The tough casing is softened by the bats digestive juices and the seed, when expelled to the forest floor, can finally take root. Most megabats roost in trees. They hang with their heads straight down and look at everything upside-down. The heads and faces of most megabats are familiar and somewhat canine in appearance, lending to the name of those most famous of megabats, the amazing flying foxes. Modern microbats make up about 900 species worldwide. They live in all environments except the polar regions and extreme deserts. They live in caves, overhangs, bridges and barns, and when they roost they usually tilt their heads back to view the world right-side up. The microbats ancestors became expert insect hunters, coming out at night to feed on nightime flyers like mosquitoes which helped them avoid competition from insect eating birds. The microbats developed echolocation abilities to help them better hunt tiny insects in the dark. Their lungs became capable of emitting hundreds of clicks or chirps in constant and rapid succession while in full flight, and their ears became huge to capture the returning echos. The hundreds of species of microbats also have diverse ways of creating the clicks and chirps they use to echo-locate, with sounds being created by the larynx, tongue, nose or mouth. Some scientists consider these variations to be dialects and these dialects even vary by region, like accents. The heads of microbats are highly precise structures with domed skulls, undershot jaws and elaborately creased, furrowed or frilled faces. The variety is astounding, with each little face designed to create and capture their own specific calls. Insect eating microbats are vital to the health and wellness of all the worlds creatures as they keep the spread of deadly diseases like malaria through biting insects under control. They also remove billions of plant-eating insects keeping crops, forests and fruit trees healthy. 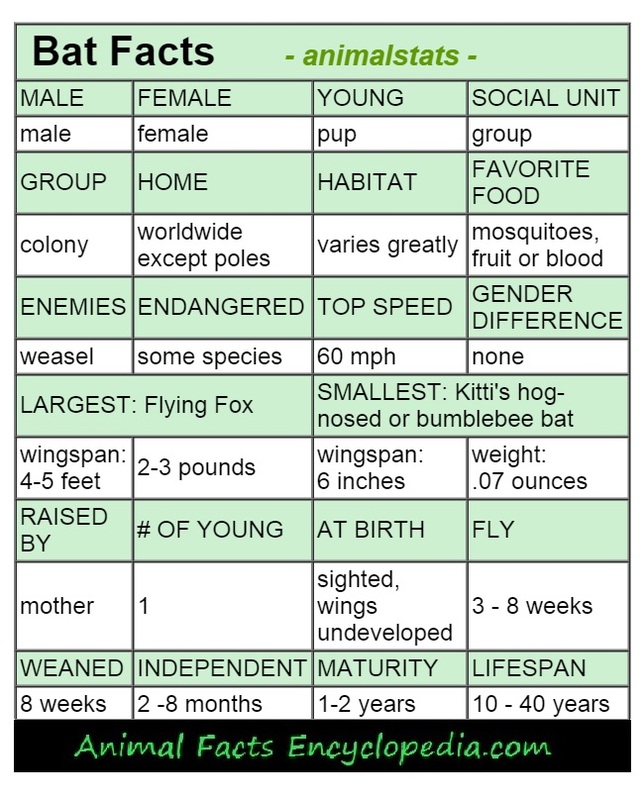 Bats are the only mammals with wings. The wings of all bats are comprised of two thin layers of flexible skin that are stretched between the sides of the body, and the bats extremely long finger bones. 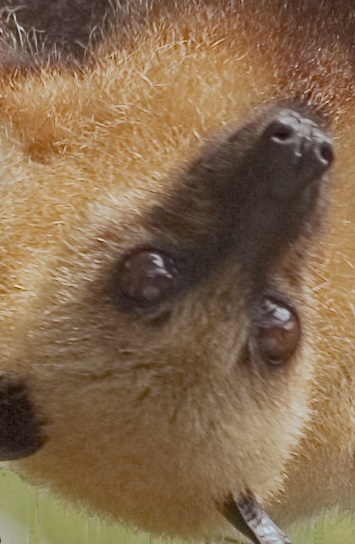 The wing membrane connects all the way down to the ankles in megabats and continues between the legs in microbats. The wings make up about 95% of the surface area of the body. 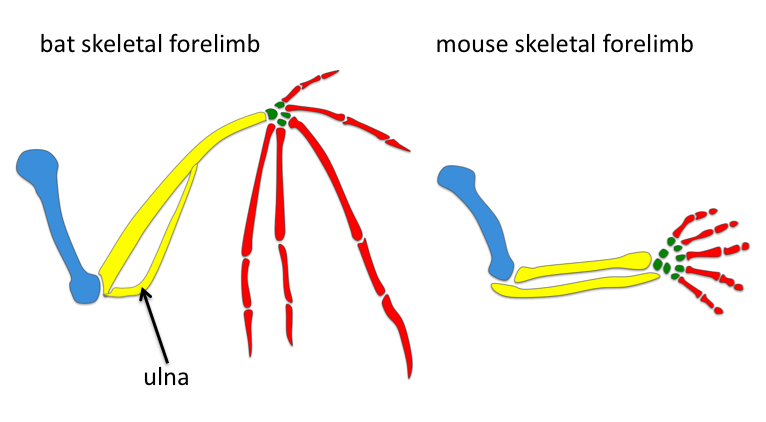 Blood vessels and nerves run between the layers and the bat has full feeling and a great deal of mobility of the wings. In fact, the many joints present in the bat wing compared to the bird wing makes the bat a more agile and efficient flyer. 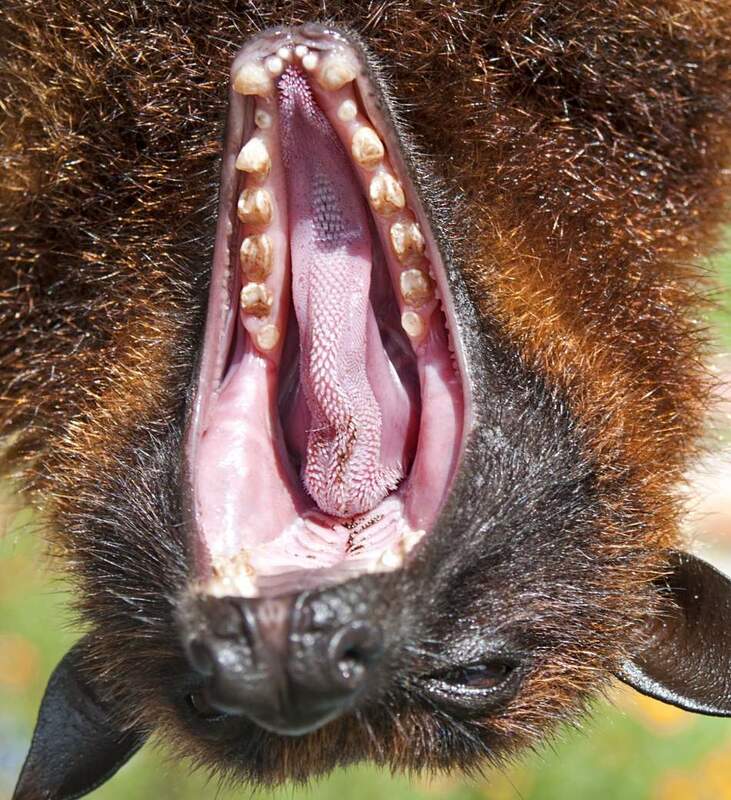 The bats wings have two dozen joints that allow for the catching and cupping of air which creates far greater lift. The thumb of the bat is not webbed and sticks out of the top of the wing. It has a sharp claw used for climbing into roosting positions. Some bats actually hunt insects on the ground and crawl around quite a bit with the use of the claws. Flying foxes will also groom themselves with their claws. Some bats can live 40 years! Some bats catch fish with their hind feet - like an eagle!